Mariner Car Wash (http://www.marinercarwash.com) is participating in the nationwide campaign, the NALA’s Shop Local for Vets on Saturday, August 18th. Please visit Mariner Car Wash at 3338 4th Street, North on August 18th to receive 10% off any custom wax services and Mariner Car Wash will be giving back by pledging 10% of the day’s sales to the cause, The Greatest Generations Foundation (TGGF). We fly an American flag at Mariner to salute our country and soldiers. We have several relatives that are retired members of the armed forces; one is a retired Brigadier General in the Marine Corp.
TGGF is a non-profit honoring WWII veterans and educating children and adults about their service. This organization is also a featured charity with the NALA, (http://www.theNALA.com), a small business association, launching Shop Local for Vets, the first campaign from Shop Local for a Cause. The NALA provides local business owners business growth opportunities through sales and marketing solutions while connecting to well-run charity organizations. Mariner Car Wash is one of many of the NALA’s businesses throughout the country participating on August 18th. Owners, Richard and Jane Lane have been in the full service car wash and detailing business for 44 years and will celebrate their 25th anniversary next summer at Mariner. A community oriented business; they participate on an almost daily basis with local churches, schools and fundraisers for charity. They also support the Tampa Baywatch and they just donated an antique Triumph automobile for their upcoming auction. Owner Jane Lane said, “We fly an American flag at Mariner to salute our country and soldiers. We have several relatives that are retired members of the armed forces; one is a retired Brigadier General in the Marine Corp and we lost a dear brother-in-law, West Point graduate who died at 54 from being exposed to Agent Orange. Also, our head bookkeeper's son is on his second mission in Afghanistan." 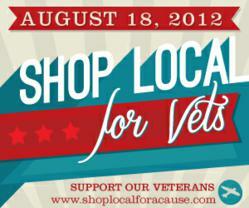 Please visit Shop Local for a Cause to learn more or to find local businesses participating on Saturday, August 18th. TGGF also has a Text to Donate number; one can donate $10.00 to The Greatest Generations Foundation today, by texting TGGF to 20222.